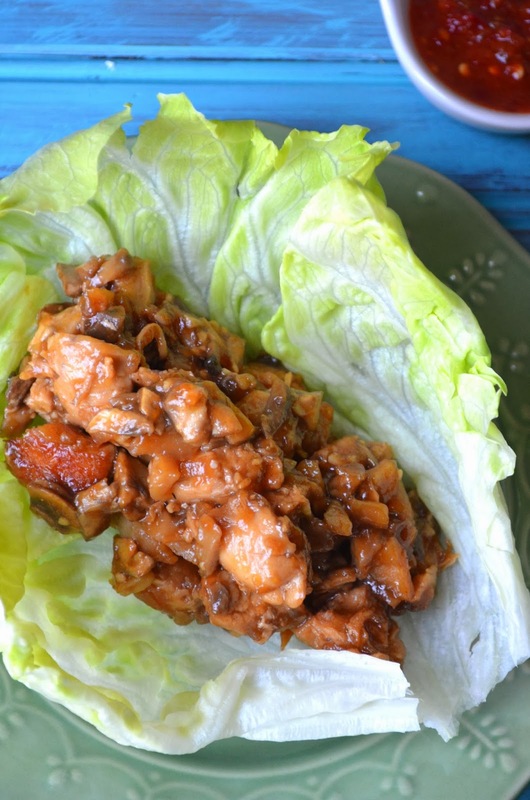 I posted these lettuce wraps a while back, but I figured I would bring them to the front since I just love them that much. Whenever I want to make a lighter meal, I usually gravitate towards salads or plain meats. But combining them? 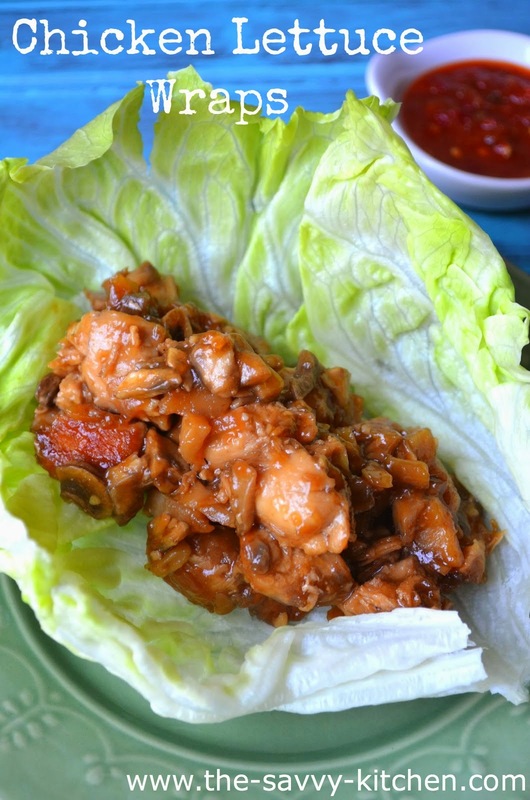 That's where lettuce wraps come into play. The filling is mostly chicken, but it's also jam-packed with water chestnuts, mushrooms and onions. So not only do you get extra filling, but also some added crunch. I just love the mixture of textures in the sweet and savory sauce. 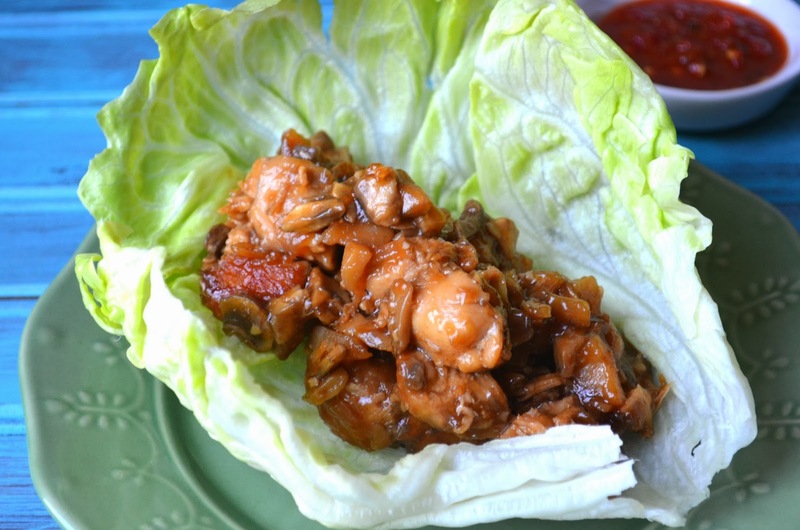 Fresh iceberg lettuce leaves are the ideal wrap for the yummy filling, making it light and refreshing. Enjoy! Make the special sauce by dissolving the sugar in water in a small bowl. Add soy sauce, rice wine vinegar, ketchup, lemon juice and sesame oil. Mix well and set aside until you're ready to serve. Combine the hot water with the hot mustard and set this aside as well. Keep the chili paste as-is. Before serving, add your desired measurement of hot mustard and/or red chili paste to the special sauce mixture to pour over the wraps. Prepare the stir fry sauce by mixing the soy sauce, cornstarch, brown sugar, and rice vinegar together in a small bowl. Bring oil to high heat in a wok or large frying pan. Saute chicken breasts for 4 to 5 minutes per side or done. Remove chicken from the pan and cool. As chicken cools, mince water chestnuts, onion and mushrooms to about the size of small peas. When chicken is cool, mince it into the same size pieces. With the same pan on high heat, add another tablespoon of vegetable oil. Add chicken, garlic, onions, water chestnuts and mushrooms to the pan. Add the stir fry sauce to the pan and saute the mixture for a couple minutes until warmed through. Serve mixture in the lettuce "cups" and top with special sauce mixture. Oh wow, this sounds delicious. And it is another reminder that I really need to try going wheat-free again. I would love if you could stop by and share on my weekly recipe linky, Kids and a Mom in the Kitchen. I am always looking for new recipes to Pin and to try with my children.